As a content strategist, the more team members you can get to write for the company blog, the better. When done right, your colleague’s pieces will help your company blog to become more revered internally and deliver more value to your readers. This is because every piece written from someone in a different department across your company often leads to more co-workers reading, sharing and sending you more valuable topics for the blog – all of which fuels your content machine. In addition to growing an invested audience internally, articles from different voices that share new department knowledge and perspectives is a great way to learn more about your target audience. Take note of what content from your colleagues performs well with your audience and continue test and optimize on the topics and formats. Finally, it’s worth noting that if you’re a team of one, and you’ve found some good writers in your company, it can help free you up to focus on strategy instead of writing. 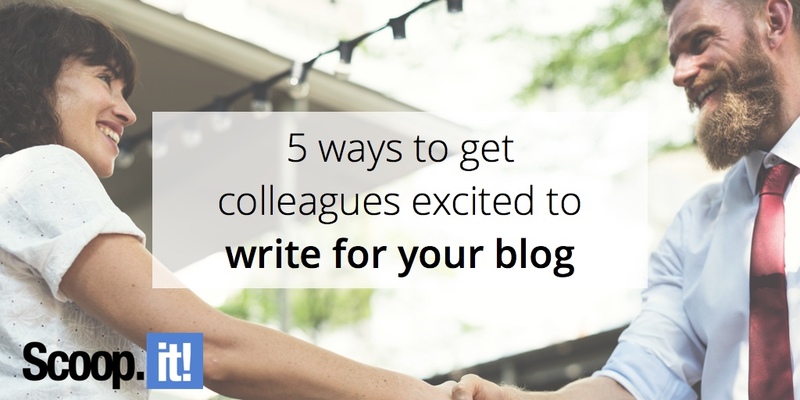 While getting coworkers to contribute to your company’s blog has many benefits, it’s also easier said than done. Most of the time if you can unearth the right motivation, you’ll be collecting more blog posts than you think. Let’s take a look at the hurdles and various methods that can help get your fellow team mates, and their managers on board about writing for the blog. The first hurdle? Helping them fit it into their task list. What value can the blog post bring to their department? Unless their manager agrees to it, chances are that writing for the blog will not be a priority for your coworker(s). Some will be motivated enough to write it after hours but unless the time is carved out on their calendar, you’ll continue to hear a never-ending cycle of “I’ll get to its”. Remember, blog posts are a time investment and don’t come easy to everyone. To ensure the blog post gets done on a timely manner from an employee in a different department, it’s best to communicate get their managers on board by talking about how the blog post can contribute to that department’s goals. Lead generation or having a better understanding of their users can usually contribute in some way. There is a blog post of value for every department and your job is to help them find what that blog post is. Ultimately, blog posts act as a method for each department to communicate publicly with the audience they’re working for and learn more about them. Overhear a coworker talking passionately about an industry-related topic? Suggest they turn it into a blog post (given it supports your company’s stance). Earlier this year, our director of operations was keeping up with multiple articles on the Fyre Festival fiasco, a failed event that brought up lots of questions about influencer marketing – what our company does – and was talking passionately about it the next morning with a few other colleagues. Our marketing manager heard her talking passionately about it and suggested she write her thoughts down. The next morning she kicked over an almost fully-fleshed out post on what we can learn about Influencer Marketing from the fyre festival fiasco. 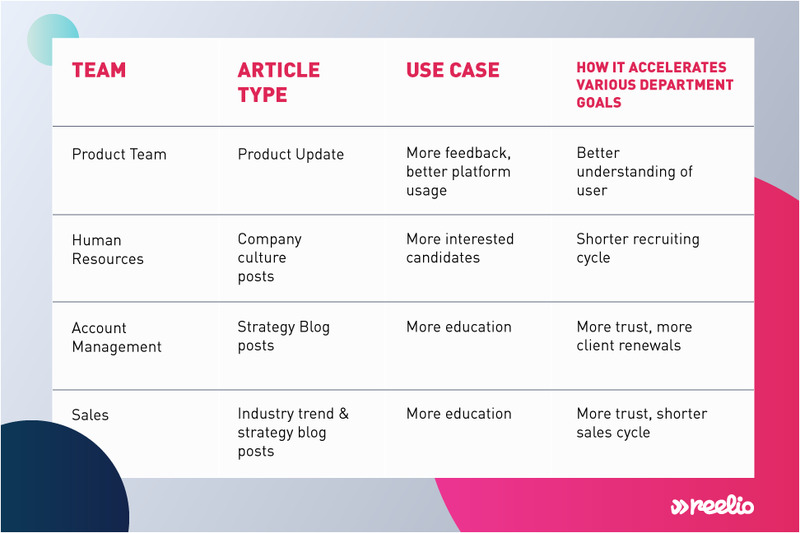 In the case of opinion-driven blog posts, don’t be surprised if your colleagues are interested, but feel stressed for time, as these tend to be unplanned around industry news. If this is the case, suggest they simply bullet point their initial thoughts and you’ll help them fill in what they don’t have time for – whether that’s an intro and conclusion – or a few other points in the main body. Remember, a colleague that was hired for a non-writing role may not feel confident in their writing skills. This doesn’t mean that they don’t want to improve and that they don’t have valuable insights to impart with your company’s audience. Recognize where each individual is at and make it easy for them to put their thoughts down on paper. This could include giving them a blog post outline and helping them beef up their thoughts with relevant statistics and facts (as the editor of the blog, it’s likely you’ve come across a statistic that can help support their statements). It also means taking an approach to editing that is lead by questions and suggestions, rather than strikeouts and rewrites, which can quickly discourage new writers. It’s also important to include the reasons behind your questions and suggestions, in this case, more context is usually helpful. Often by asking the right questions, you’ll find you can get your co-worker to rephrase for the clarity you were looking for without telling them how to do it. This is a much better approach for both parties and helps instill confidence in the colleagues who spend their day-to-day exercising other talents. Recently, a coworker published a blog post about influencer marketing ROI that mentioned a statistic our account management director thought important enough to share at our all-hands company meeting. The CEO then piggybacked on her comment and encouraged everyone to read the blog consistently if they were not doing so already. Getting leaders at the company to endorse your blog is one of the most meaningful forms of validation you can get as the head of content. In this case, it was the team member who shared that article with our head of account management, but it can and should also be shared by the editor. Whether you’re sharing it with the head of a department or the entire company, highlight the information that can be useful to departments and the metrics that show how the blog post furthered the department’s goals. This will help colleagues and their managers continue to see value in contributions to the company blog. Ultimately, if you can get even a few enthusiastic colleagues to buy into the blog and know which results to highlight from the blog at company meetings, I’m willing to bet you’ll find that a few more colleagues have ideas they want to write about. To have your voice be heard is to have it be valued. Give your colleagues a platform to share their knowledge and see your readership and engagement grow in return. Jessica heads content strategy and oversees communication for Reelio, an influencer marketing platform that connects social media influencers to brands. Prior to Reelio she was the online voice and assistant editor for the global female founder community, Women 2.0. When she's not writing you can find her in dance class, or cheering for a San Francisco sports team in New York.